If Apple Supports Augmented Reality, Will People Finally Care About Augmenting Their Reality? However much weight big-names apps such as Layar throw behind augmented reality, it's furtherest from my mind when I'm trying to find a location—and I imagine you're the same. But with Apple Maps tipped to add it, will it finally take off? A patent filed with the US Patent and Trademark Office in February 2010 has been unearthed, specifying that Apple's very keen on adding augmented reality to its Maps app. They've already got the necessary goods to add the magic today—a camera, GPS, sensors, compass and gyroscope—but until now have left it to third-party developers to augment users' reality themselves. 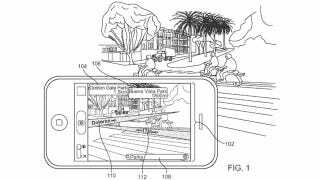 The picture shown in the patent filing suggests that holding an iPhone up in the street will display the users' surroundings on the screen in real-time, along with the distance to various landmarks. As you know with augmented reality, twirling around in a circle would show what the camera sees, right there on the screen, with street names potentially being picked out and directions visually shown.